Himachal Pradesh Tourism welcomes travelers to some of its most fantabulous and serene locations & spots that continue to attract vacationers, leisure travelers, honeymooners, business travelers and adventure seekers. The level of serenity and tranquility one can witness here is unsurpassed that takes away all their stressed and burdens. Upon arrival at Chandigarh Airport/ Railway Station, proceed to Shimla also known as the Queen of Hills and capital of the state of Himachal Pradesh. On arrival check-in to the hotel. Later proceed for half day Shimla local sight-seeing visiting SankatMochan Temple, Indian Institute of Advanced Studies &Lakkar Bazaar. Overnight stay at Shimla Hotel/Resort. After breakfast, proceed to Kufri which is appr. 01 hr drive from Shimla and is beautifully tucked on an altitude of 2,622 mtr. 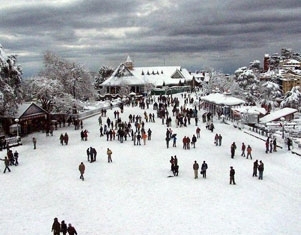 Kufri is a tourist hotspot for its scenic beauty and outdoor activities. Also visit Fagu and enjoy horse/yak ride in the apple orchards (optional). Also visit The Himalayan Nature Park and the Indira Tourist Park around Kufri. Return back to Shimla. Later in the evening stroll at the famous shopping area of Shimla town – The Mall &The Ridge. Shimla’s landmark – Christ Church & Library building are worth watching. Overnight stay at Shimla Hotel/Resort. After breakfast, check-out and proceed to Manali also known as the Valley of Gods. Enroute sight-seeing of Kullu which includes Pandoh Dam, Vaishno Devi Temple &Manikaran Sahib Gurudwara.On arrival check-in to the hotel.Overnight stay at Manali Hotel/Resort. After breakfast, enjoy breathtaking drive to Snow Point on the road to Rohtang Pass which is a gateway to Lahaul, Spiti&Leh Valley. Rohtang Pass is located at a height of appr. 4000 mts and is covered by snow round the year. Rohtang Pass remains closed during winters. Later proceed to the famous Solang Valley which is a preferred location for adventure activities (optional) such as parachuting, paragliding, skating, zorbing and horse riding. Return back to Manali. Overnight stay at Manali Hotel/Resort. After breakfast, proceed to Dharamshala also known as the “Little Lhasa of India” is the second capital of the state of Himachal Pradesh. Dharamshala is set to the background of Dhauldharmountains and the seat of his Holiness, The Dalai Lama, the spiritual leader of the Tibetans. On arrival check-in to the hotel. Spend the evening for leisure/shopping activities. Overnight stay at Dharamshala Hotel/Resort. After breakfast check-out and proceed to Dalhousie. On arrival check-in to the hotel. Later proceed for half day tour of Dalhousie visiting SubhashChowk, Gandhi Chowk, Old Church, Panchpula&Sathdhara. Overnight stay at Dalhousie Hotel/Resort. After breakfast, proceed for Khajjiar day excursion, a scenic spot set amidst backdrop of dense pines, deodars, lush green meadows and sparkling Khajjiarlake. Khajjiar is nestled amidst foothills of Dhauladhar ranges of western Himalayas, offering panoramic view to the visitors. Rest of the day free for leisure activities. Return back to Dalhousie. Overnight stay at Dalhousie Hotel/Resort. After breakfast pack your baggages, check-out and proceed on time to board your flight/train with sweet memories of your holiday. We await for your next visit. Bon Voyage. Service ends.